With My Needle: A new needlework box for your stitching enjoyment! 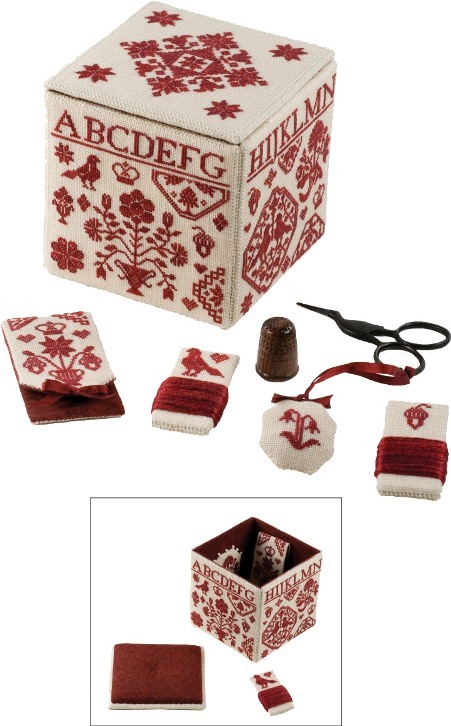 A new needlework box for your stitching enjoyment! By now many of you have seen my two newest designs at your favorite needlework shop, either in person or on-line. A few days ago I introduced you to Hannah Cummins, a charming reproduction sampler. Today I'm showing you my newest box, A Quaker Needlework Box. On my model, I used 32-count Antique Ivory linen and Gloriana Cranberry silk thread. I cross stitched the motifs over one linen thread using just the one color of overdyed silk thread. There is no reason why you couldn't instead stitch the project over two linen threads to create a larger box. Just think of all the "goodies" a larger box could hold! Regardless what size box you choose to stitch, make sure you buy enough linen and embroidery thread from the same dye lot. The chart directions tell you how many cross stitches there are in the entire project. On the inside of the needlework box are two pinkeep medallions. A large pincushion is on the inside of the box lid. (When stitching, why not take off the box lid, and turn it over to reveal the pincushion which will come in handy as you're stitching?) Charts and directions are included for the embroidered box, the pinkeep medallions, a scissors weight, a needlebook, and two threadwinders. This project uses only backstitch, cross stitch over one linen thread, and four-sided stitches. Stitch diagrams are provided along with very detailed assembly directions. I've also included suggested linen and lining layouts so that you can make the best use of your fabric. I hope you like my newest designs. I need to run. I'm off to take my Hannah Lancaster sampler to be framed! I can hardly wait to get Hannah back and on my walls. What a beautiful quaker box! Love it! Looking forward to seeing your Hannah Lancaster framed. Have a great weekend! Oh, this is just so beautiful! Love it. I love the idea of doing this over one! So beautiful! Gorgeous Ellen! I just love it! I love this!! It's on my list, too! I wish I could make one! You are super TALENTED!!! It's so dainty and pretty Ellen! I love the Quaker style! !